Apprehensive Films Blog, The Ultimate Cult, Horror, Indie and Grindhouse Label: It's Midnight on Friday The 13th! So technically people will say it's Saturday the 14th, but in my heart it's just into the midnight hour of Friday The 13th! 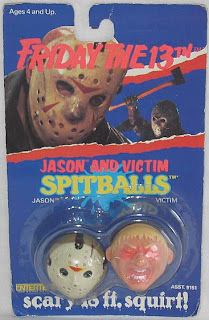 In celebration I figured I'd post a picture of one of the most odd Friday The 13th toys ever manufactured. And yes I own a pair of these, but the packaging is long gone. Jason Voorhees and Victim Spitballs. Spitballs were the rage in the late eighties for about a year. There was also a Freddy Krueger and Victim Spitballs set and a bunch of GhostBusters Spitballs. Enjoy the pic! I love the selling point of an 18 foot squirt!